Living Thing, the fifth album from Peter Bjorn And John, is a strong indication that the acute pop minds behind 2006 breakthrough record Writer’s Block have much more to give. Despite its spare arrangements and instrumentation, Living Thing incorporates fuller melodies and more intricate sounds, ranging from dub to a sort of Merseybeat gone electro. Peter Bjorn And John are guest editing magnetmagazine.com this week. Read our Q&A with them. Peter: Father Ted is an Irish situation comedy from the ’90s. The show depicts the lives of three Irish Catholic priests on the remote fictional Craggy Island off the west coast of Ireland. I am crazy about this show. I have the boxed set and can’t get past it. It is so stupid that, like surströmming, it’s an acquired but maybe not a mature taste. It does have a lot of clever references to popular culture, though. And a funny cameo by Father Brian Eno! I love the fact that one of the priests is a crazy alcoholic and the other one doesn’t know anything about religion whatsoever. It’s just something about priests behaving stupidly. It really shows pompous religion with its pants down. The actors are splendid. 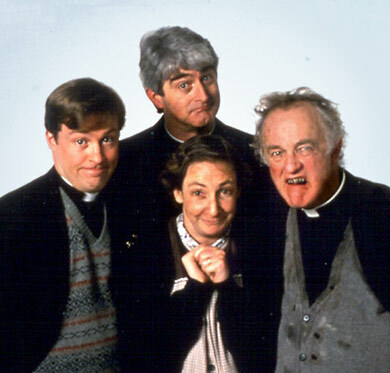 Dermot Morgan (Father Ted) died from a heart attack at a party after finishing the last episode.